Will it hurt to have my child's teeth fixed and how much will it cost? These are often the first questions asked when an injured person finally gets to the dentist's office. As a general rule the first obligation of any health professional is to relieve pain. This can often be accomplished immediately with topical anesthetics followed by local anesthesia, which will give several hours of relief, followed by taking pain killing and anti-inflammatory drugs like ibuprofen. Once comfortable, your dentist should discuss all treatment options together with their risks, benefits and alternatives including costs. Are my kids more prone to injury because their front teeth protrude? Yes, people who have upper front teeth that are very prominent or protrude are more at risk for injury, whether sports related or otherwise. The first line of defense is to wear a mouthguard when there is an associated risk of injury with any activity; the second and more long-term consideration is orthodontic treatment (braces) to move the teeth into a better position and potentially out of harm's way. Orthodontic treatment usually will result in both better biting function and improved appearance, as well as contributing to better overall dental health and wellbeing. If replanted (adult) teeth in adolescents have a short survival rate, why bother? Good point, but there are many important considerations. Here are just a couple of the more major ones. Firstly, a shortened survival rate is usually measured in many years, although if not replanted immediately — within five minutes, a tooth will not last a lifetime. Secondly, in a younger (growing) person — with teeth developing and erupting, jaws and face growing — it's best to replant the tooth and wait at least until maturity before considering a more long term tooth replacement option. Why aren't baby teeth replanted? The short answer to the question is that baby teeth will be lost in the normal course of events. The major concern is the risk to the underlying permanent (adult) tooth posed by replanting a baby tooth to say nothing of time and costs. Replantation of baby teeth is not recommended by Pediatric Dentists. Individual situations need to be evaluated with a dentist to decide the best of many available options. While not exhaustive, this review is designed to educate non-professionals on how best to assess dental related injuries and make decisions to help. 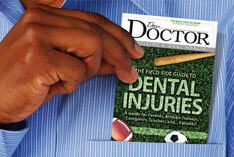 Proper attention can save pain, alleviate anxiety and years of costly dental treatment. A little knowledge, as they say, can go along way.